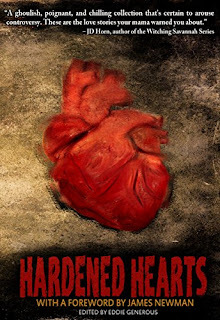 Hardened Hearts is an anthology of love gone wrong, or weird!!! Before we find love for ourselves we grow up dreaming that love is a magic wand that will put everything right once we find it. However what love can give you, it can also take away. It can ruin you as much as heal. I really liked the range of stories in this anthology some were downright scary such as Heirloom, (Theresa Braun), or The Pink Balloon (Tom Deady) some were heartbreaking such as It Breaks My Heart to Watch You Rot ( Somer Canon) and Burning Samantha ( Scott Hallam) which really struck a chord with me and some were just really creepy in a good way such as Meeting the Parents by Sarah..L.Johnson and The Heart of the Orchard by Erin Sweet Al-Mehairi. 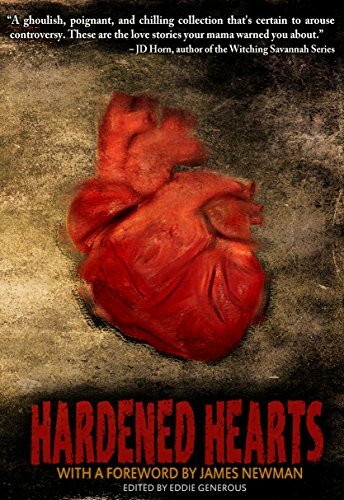 All the stories in here are really great and there is something for everyone in Hardened Hearts. I also really liked 40 Ways to Leave your Monster Lover by Gwendoline Kiste, What is Love by Calvin Demmer and Brothers by Leo X.Robertson. These were stories that explored the dual nature of love, how it can both give and take. Some had a sweet nature such as Porcelain Skin (Laura Blackwell) and Dog Tired by Eddie Generous which show brilliantly the enduring nature of love and how far people are willing to go to hold on to it. Hardened Hearts is out now!